1. Prior to reconstitution, visually examine the outer bag for damage. If the seal is broken or damage is observed, do no open the outer bag. Sterility of the inner bag surface may be compromised. 2. Gather the following items prior to reconstitution of the product: appropriate number of bags of Sterile Water for Injection and, depending upon the method of filling, appropriate sterile tubing and adapters. 3. Under laminar flow conditions, aseptically remove the outer bag. 4. Do not use the inner bag if particulate or foreign matter is present, if the dry powder is dark yellow or brown, if the seals are not intact or if there is any other damage to the bag. In such cases, discard the bag immediately. 6. Remove the translucent, unthreaded cap from the reconstitution (smaller) port and discard it. 7. Reconstitute the powder through the reconstitution port with the appropriate amount of Sterile Water for Injection. 8. Mix the reconstituted bag until complete solution is effected (approximately 15 to 25 minutes, depending on the product). 9. When foam dissipates, visually inspect the bag to verify that the solution is the appropriate color and free of particulate matter. 10. Unscrew the clear, threaded cap from the transfer (larger) port and discard it. 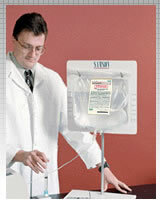 Attach sterile tubing and filling adapter unit to the transfer port. Reconstituted solution can now be transferred using the transfer port and the filling adapter. *Procedures may vary in accordance with equipment, systems and standard operating procedures utilized within individual institutions.